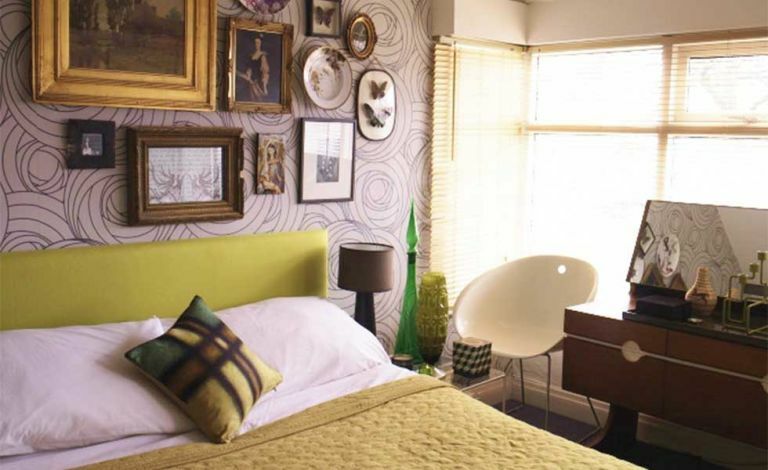 The bedroom is probably the easiest room in the house to create a vintage look in. There are two clear ways to get a vintage look in this room – either a Mid-century modern space with clean Scandinavian influences from the 1950s-1970s, or a more traditional vintage room reminding us of the 1920s-1940s. The key to creating a vintage bedroom is to choose mis-matching furniture so it looks like you have collected it over the years. For the bed, I would choose a cast iron frame, which you can buy new from Laura Ashley, Marks & Spencer or Ikea. Choose 1940s utility furniture or older pieces, which you can always paint, although please only do this on pieces that need it and cannot be restored. Rattan furniture, such as 1920s Lloyd Loom bedroom chairs and linen baskets, also work really well here – look out for bedside tables in this material, too. I would hang wallpaper on every wall in a vintage bedroom, sometimes choosing two patterns tied together by a key colour. Paint the woodwork in a hue that you pick out from the wallpaper, such as pinks and greens – green was very popular in the 1930s and 1940s and will give you an authentic look. I love William Morris designs, especially in green tones, as well as K2’s Lucy in yellow and Graham and Brown’s Foxglove in lilacs, which remind me of old nature drawings. As this style allows for more clutter, don’t store everything away! However, vintage cases, trunks and hat boxes make great storage and sit well in a large pile in the corner or at the end of your bed. Store jewellery in glass bowls on your dressing table, hang handbags from the end of the bed, in a glass-fronted cocktail cabinet or even on the wall. Mood lighting adds to the vintage feel so choose standard lamps with fringed shades from the 1920s in muted tones to tie in to your colour scheme. Hang a chandelier from the ceiling, which can either be modern from shops such as John Lewis or Laura Ashley or find a vintage piece, such as an original French piece with metal flowers and peeling paint! Vintage lighting buying tip: As with any vintage lighting, make sure that it has been rewired to modern standards. If you are unsure, factor this cost into the purchase price. Kate’s book Style Your Modern Vintage Home is available online and in bookshops now.